BreathEasy BP PRO series and BH series (home, office, small spaces) air filtration systems are our air purifying units configured specifically to adsorb the dangerous chemicals, gases and toxic particles emitted from volcanic smog, or VOG. When Sulphur dioxide and other gases and particles are emitted by an erupting volcano that react with oxygen and moisture in the presence of sunlight this forms volcanic smog and fog. A special blend of chemical media provides increased chemical filtration, which is ideal for residents and businesses located within 100 miles of a volcano. Volcanic smog or VOG is formed when sulfur dioxide and other pollutants from an active volcano react with oxygen, moisture, dust and sunlight. This creates a dangerous mix of airborne pollutants that can penetrate deep into the lungs and irritate the tissues and mucus membranes of the eyes, nose and throat. The long-term effects of breathing in volcanic smog are unknown. Call us for help with your product selection, toll free: 1-800-626-0664, Skype: lito.espinosa, or fill out and send the contact form below. chemical fumes, powder, fine dust removal, solvent vapor fumes, pharmaceutical powder filling, compounding, light grinding dust, acid gas fumes, anesthesia gas containment, epoxy fumes, and many more. 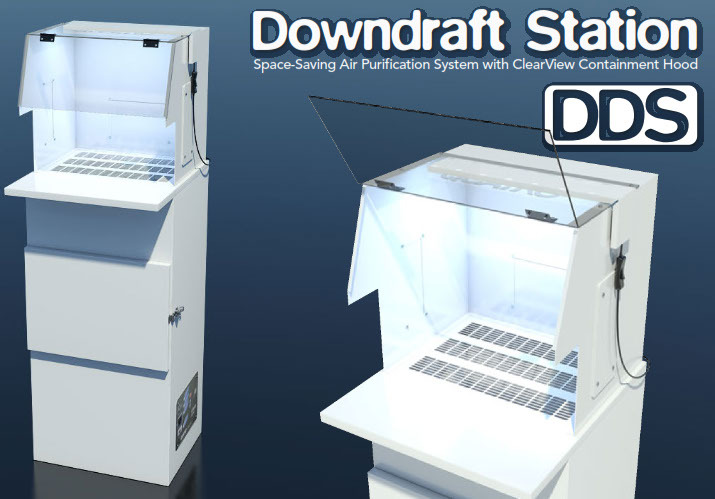 Powered by an ultra-quiet brushless motor and a multi-stage filtration system, the DDS Downdraft Station removes harmful particles from the work area and helps you maintain a clean and healthy workplace. 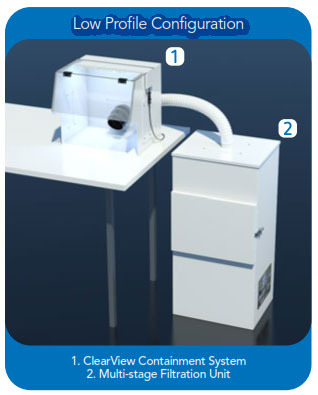 For restricted spaces, the Low Profile Configuration allows the system’s containment hood to be installed on the workbench and connected to the top or the back of the Multi-stage Filtration Unit via flexible hose. Contact us for help with your product selection – 1-800-626-0664 or fill out the contact form below.